Whether you are recovering from an orthopedic injury, stroke or concussion, Madonna TherapyPlus uses the most advanced techniques and technology to treat a variety of conditions from minor sprains to complex diagnoses. 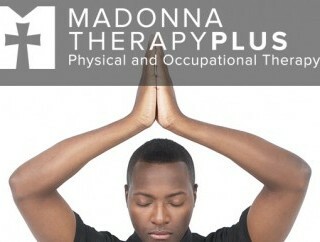 With comprehensive services at four locations, recover with Madonna TherapyPlus. Madonna TherapyPlus uses the most advanced techniques and technology to treat people with minor sprains to complex conditions. Fill out forms before your appointment and find out what you’ll need on your first day in our patient resources center. The Rehabilitation Day Program (RDP) is designed to help adults and children with a physical or cognitive disability learn to function more independently in their home and community. RDP provides an intense and holistically oriented approach that includes medical monitoring, coordinated therapies and education. The comprehensive program is personalized and designed to meet each patient’s individual needs. The Structured Independence Program allows any patient who completes their physical or occupational therapy at TherapyPlus to continue their exercises at Madonna ProActive. Individuals can take advantage of the pools, weight equipment and aerobic equipment, as well as participate in group fitness classes. The RunWell Program is for runners at all levels who want to keep running at their best. Our physical therapists will evaluate your form and develop a training program to help you meet your running goals, whether it is preventing injuries or improving your personal record. The SwingWell Program is for golfers who want to improve their swing. Designed and developed by the Titleist Performance Institute, it includes a physical assessment to identify how the body physically influences the golf swing. The physical therapist will develop an exercise program to correct any physical faults detected by the assessment.